We've had the pleasure of styling and creating many beautiful look books with some of the most talented people in the industry. Collaborating with fellow creatives is one of the many highlights of Dirty Fabulous. Taking inspiration from the fantastical and contrasting original vintage fashion photography. Soft and delicate 1950's prom dresses worn with strong, ethnic headpieces. For the fierce warrior princess within us all! Dirty Fabulous's first collection of in-house designed wedding dresses. A evocative, high concept editorial shoot completed with a team of creatives from County Monaghan. Models: Lorraine, Airida, Miriam, Laura, Ustina, Cait, Ellen and Joanne. Vibrant splashes of colour add a fun and quirky feel to the most regal vintage dresses. Models: Aisling, Claire, Sile and Ally. A little bit of kitch and a whole lot of glamour. This editorial shoot mixed it all up with bridal gowns from the 1930's to 1970's. 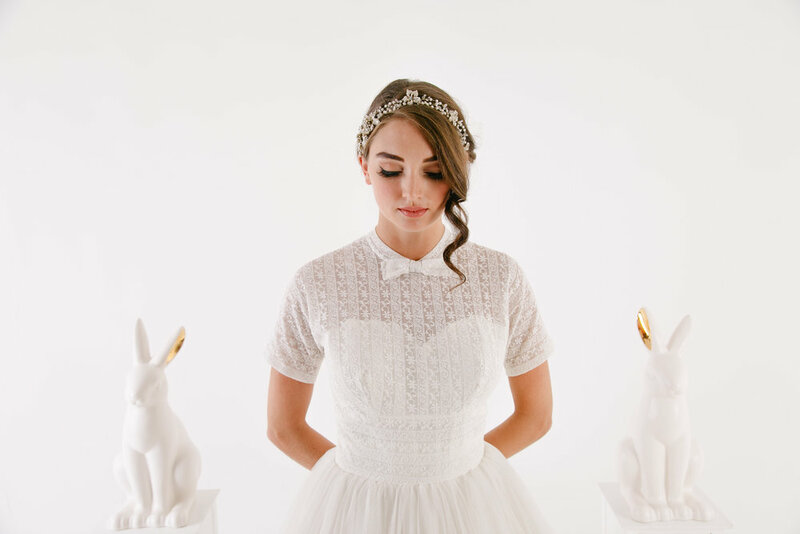 Chic and classic vintage looks, perfect for a romantic elopement. Styling: Kathy Sherry, Caroline Quinn. A dark circus filled with beautiful vintage porcelaine dolls with glassy eyed stare.